It was ten days before the election and our insurgent 2014 campaign for Governor was growing increasingly confident that we were in the running for an endorsement from The Baltimore Sun, the state’s paper of record. Such an endorsement would help us double down on the momentum our advertising campaign generated in the final weeks of the race. It could be the game changer we were hoping to pull off during the campaign’s closing arguments. Volunteers, supporters, and political insiders were energized and felt confident of our chances. And then it landed with a thud. The paper endorsed another campaign in a head-scratching editorial that was almost apologetic in how it heaped praise on our efforts while simultaneously expressing concerns about their chosen candidate. Their rationale seemed to boil down to one main sticking point: my advocacy for marijuana legalization. Maybe my campaign team was right – there would be a high political price to pay for taking this stance. I’ll never forget the look they gave me when I told them we were going to advocate for legalizing marijuana as one of our policy platforms in the Governor’s race. After working through the typical arguments that a political team is conditioned to give a candidate who wants to adopt such a controversial stand, we made our way to the real substance of the policy and my team eventually agreed with me that it was the right thing to do. While it may have cost me an important endorsement from a key opinion driver at a crucial point in the race, I do not believe that my support for marijuana legalization ultimately cost me the election. I can say that even if it had, I would not wish I had advocated differently. It was then, and still is, the best policy choice for our state. And with almost three years of additional experience and data from other states to back up this claim, it is time for the Free State to step up its advocacy to join the growing number of states that are being bold with their reforms of the failed war on drugs. So, Baltimore Sun, you wanted to wait to see how the experience has played out in Colorado and Washington State. Here is a snap shot: tax revenues are up without any increases in consumption or drug related crimes. Though they originally estimated $70 million in annual tax collections from their legalized market, Colorado legal marijuana sales nearly topped $1 billion in 2015, with $135 million in tax revenue generated. And in 2016, the state announced that they generated nearly $200 million in tax revenues off of more than $1.3 billion in sales. Washington State, with a higher tax on the substance, only sold $488 million but brought in $128 million in revenues in 2015. Their 2016 tax intake soared to $256 million. National legal sales of marijuana have grown from $4.6 billion in 2014 to $5.4 billion in 2015, increasing to $6.7 billion in 2016. By 2020, that number is expected to jump to $21.8 billion as at least eight states (OR, WA, CA, NV, AK, CO, ME, MA) and the District of Columbia now have legalized the recreational use of marijuana through voter-approved ballot initiatives. Legislatures are taking note, too. In 2016, the Vermont Senate voted in favor of a legalization bill (SB 241) that failed in the House. In the 2017 legislative session, the Senate again passed a legalization amendment to another bill by a vote of 21-9 in late April but the House again blocked its consideration, even though Governor Shumlin has said he would sign it into law. The Vermont Senate’s efforts represent the first time marijuana legalization legislation has been approved by any legislative chamber – and the trend suggests it won’t be the last. Maryland, will you live up to truly being the Free State, and find the courage to take on this important policy challenge? We have seen from Colorado and Washington State that a responsible regulatory plan can be implemented to protect the public’s interests as we shift to an updated strategy on how to deal with the legal status of a substance which is no more (and perhaps arguably less) dangerous than alcohol or tobacco. 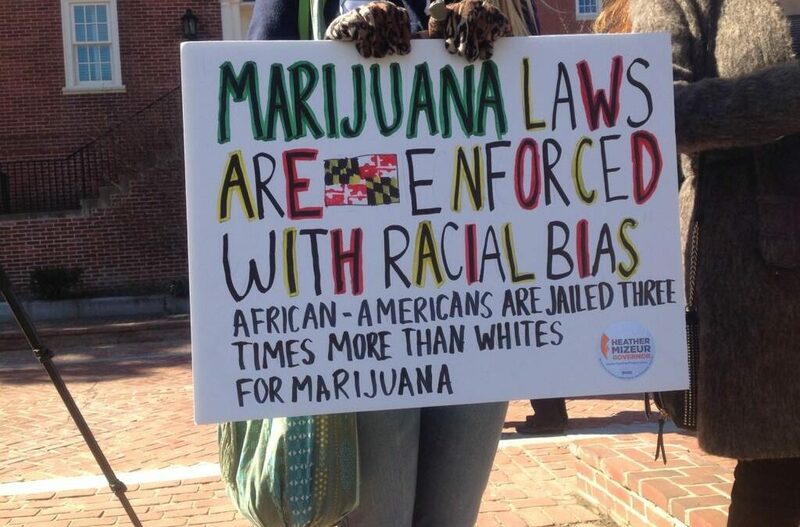 Addressing some of the racial bias associated with marijuana incarceration policies, Maryland stepped up in 2014 to decriminalize possession of a small personal amount of marijuana. It would be wise for Maryland to take the next step and give serious consideration to joining the ranks of states that have chosen to legalize, tax, and regulate marijuana. Support for marijuana legalization in Maryland is strong and growing every year. A Washington Post-University of Maryland poll conducted in September 2016 showed that 61% of Marylanders — and 64% of likely voters — support ending marijuana prohibition. This is a sizable increase over just two years before, when support was at 54%. There are many great initiatives we could fund with the projected revenue we would generate from legal sales in Maryland. The data in our state suggests that we could raise between $122 million and $157 million per year if we legalize, tax, and regulate marijuana here at home. In 2014, I proposed using that revenue to eliminate the achievement gap in our schools by funding a universal pre-kindergarten program for 3 and 4 year olds. However, there are any number of worthy policy initiatives that could be launched with this revenue. There are other potential benefits to modernizing our outdated cannabis laws. New scientific studies show a strong correlation between a reduction in heroin-related overdoses/hospitalizations and access to legal medicinal marijuana. An April 2017 study in the journal Drug and Alcohol Dependence tallied hospital discharges in 27 states from 1997 to 2014. Where medicinal cannabis is legal, hospitalizations caused by opioid dependence dropped by 23 percent and those caused by opioid overdoses dropped 11 percent. Conversely, hospitalizations caused by cannabis did not increase in states with legal medical marijuana. Advocates and supportive lawmakers need to remember that the tax rates on legal marijuana need to be low enough to wipe out the illegal market. One of the big benefits of legalizing marijuana is putting the substance into state licensed facilities where we are more likely to keep the plant out of the hands of under age users. Experience in other states suggests this magic number is between a 10-25 percent excise tax on the sale of the product in any form. Policy makers need to keep in mind that it takes a while to develop the market, formulate a regulatory system, and collect the revenue, but often the collections eventually exceed projections by significant margins. The decision to change the way we treat this plant under our law is no longer a radical choice. What should be radical, however, is the way in which we honor and use this medicine. Even though I am an advocate for legalization, I offer my own notes of caution on how marijuana is used in our culture. Like any plant medicine, its use should be done in a respectful manner. Overwhelmingly, our culture has lost its connection to the consciousness of the plant itself. Indigenous practices for millennia have informed us that curative plants have sentience and wisdom. That is where their medicine is derived. But how often are we encouraged to connect with the spirit of this plant when using its medicine? Cannabis can be a beautiful, healing plant for many maladies when honored and respected. Like anything that can be misused, it can also work against one’s best interests. When marijuana is used as a crutch to tune out and distract oneself from feeling and experiencing the challenges of life, then one is more at risk for becoming disconnected from the guidance of consciousness. However, used with a mindful approach, and cannabis can strengthen one’s connection to inner wisdom and healing. Marijuana is not a medicine I have much experience with; however, I have deep respect for indigenous spiritual teachings on how to best honor plant medicines in general. These healers would encourage us to pray over the medicine before receiving it; thank it; be clear about our intentions for healing or connection; use it in moderation; and bless and thank the plant again for its healing and teachings afterwards. If cannabis is a medicine for you, perhaps you can consider incorporating this mindful approach to its usage if you are not already doing so. Creating a shift in how this plant is honored and used in our culture can go a long way in assuring that its medicine is available for positive benefits.